As I continue to explore how what I’m calling “renewable experiential and applied learning” (REAL) can provide ways to improve education, I keep coming back to information literacy as a fitting and necessary foundation for REAL experiences based on renewable assignments. 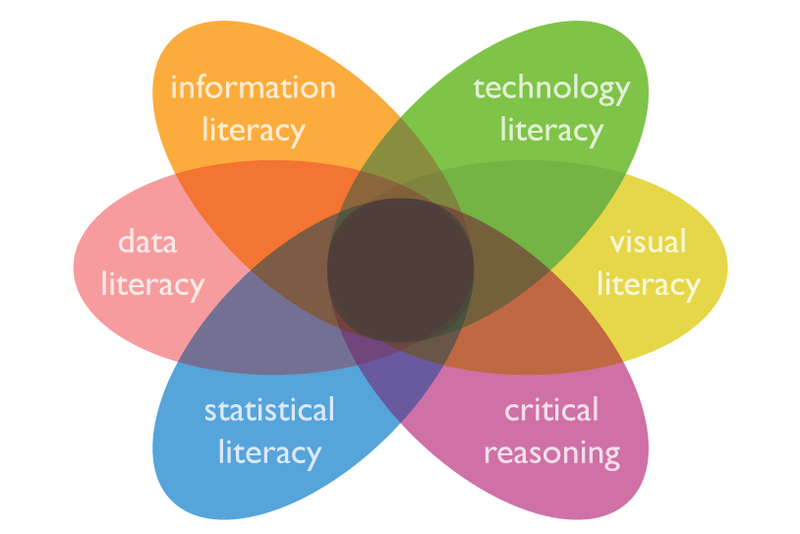 Renewable assignments promote learning goals for information literacy, and in turn, information literacy is a necessary component for learner success in REAL work. I’ll also provide a specific, example of a renewable assignment that demonstrates this close connection with information literacy. Let’s start with the learning goals outlined in the best open resource on information literacy I know, the Open SUNY Textbook (OST) Information Literacy User’s Guide, and see how these goals both describe and call out for a REAL approach. Each one of these goals is fleshed out in the Introduction to this work, including more specific goals that are mapped to behavioral, cognitive, affective, and metacognitive domains. Goal 1: Evaluate content critically, including dynamic, online content that changes and evolves. While renewable assignments don’t necessarily require critical thinking, they do engage learners in open works that become dynamic through their own and others’ interactions. Obviously, any good assignment would also ask learners to exercise critical thinking. Goal 2: Understand personal privacy, information ethics, and intellectual property issues in changing technology environments. The open-licensing component of renewable assignments asks learners to engage directly with the privacy and property rights of information, not merely in the object of the assignment, but by design also in the output of the assignment—their own work. Because learners’ work will live openly, they will at a minimum need to grapple enough with questions of privacy and intellectual property to publish their work with an open license. Questions of ethics aren’t necessarily built in to renewable assignments, but like with critical thinking in Goal 1, are natural extensions of thoughtful activities. Goal 3: Share information and collaborate in a variety of participatory environments. Again, REAL’s very structure leads learners to engage directly with this learning goal, as sharing through open publication is built into every renewable assignment. Like ethics and critical thinking, collaboration may not be a component of every renewable activity, but it’s a short step away when assignments ask learners to engage with already existing open materials often built collaboratively, and publish their own work openly, thereby inviting future collaboration. Goal 4: Demonstrate ability to connect learning and research strategies with lifelong learning processes and personal, academic, and professional goals. REAL’s experiential and applied components specifically ask learners to think in multiple contexts directly tied to their larger lives, traveling the circuit from learning to experiential activity and back again to reflection. For a concrete example, here’s a simple assignment, inspired by some of the activities in that same original OST work on information literacy and designed to lead to the same learning goals, but devised to be renewable, and fit any group participating in a common activity. Simply, ask your group to build a guide for whatever activities the group shares collaboratively. I call this a “choral” handbook based on ideas from Mike Caulfield about how multiple, choral explanations can aid learning. Your group can make its own Choral Handbook using tools common and familiar to the group. A truly renewable assignment would produce a public, openly licensed handbook that would then be enriched and improved as new people engage in the exercise. Go to the place where you engage in any activity common to our group. Which part of the activity do you think is hard but you know how to do? Do that hard part. Take notes. Drawing or taking pictures can be helpful. Look up things you don’t know. Post your description of that hard part of the activity and the step-by-step actions you take to do it in a good place in our Choral Handbook. For each step, include if you created or where you found that information so others know where your guidance comes from. Read our Choral Handbook to find a post about a different activity or part of an activity that you don’t know how to do as well or you think can be improved. Follow the steps in the post. Pay attention to where the information in each step comes from: is it credible? Is there better information? Ignore, add, or change steps as you see fit. Take notes. Drawing or taking pictures can be helpful. Look up things you don’t know. Alongside that same post, add a new post of the step-by-step actions you take to do that activity that you think improves on or provides a worthy alternative to the original post. Remember, because all posts in our Choral Handbook are openly-licensed to permit revision and reuse, you can reuse any or all of any other post in your own work as long as you attribute the original author. Return to your post from Part 1. Based on your experience reenacting a different activity in Part 2, is there anything you would add, take away, or change to make it better? Revise your post as you see fit. For each step, add any new or changed sources of information.